Use the External Link option and enter a URL in the format http://www.example.com in the Link to field below if you need to add a hyperlink leading to an external website. Use the Place in Document option and select one of the existing headings in the document text or one of previously added bookmarks if you need to add a hyperlink leading to a certain place in the same document. ScreenTip text - enter a text that will become visible in a small pop-up window that provides a brief note or label pertaining to the hyperlink being pointed to. To add a hyperlink, you can also use the Ctrl+K key combination or click with the right mouse button at a position where a hyperlink will be added and select the Hyperlink option in the right-click menu. Note: it's also possible to select a character, word, word combination, text passage with the mouse or using the keyboard and then open the Hyperlink Settings window as described above. In this case, the Display field will be filled with the text fragment you selected. By hovering the cursor over the added hyperlink, the ScreenTip will appear containing the text you specified. You can follow the link by pressing the CTRL key and clicking the link in your document. 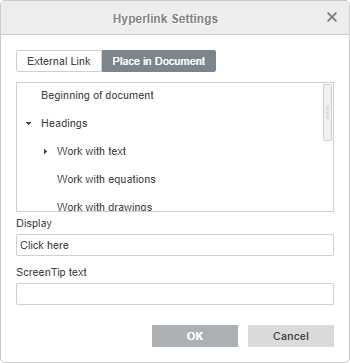 To edit or delete the added hyperlink, click it with the right mouse button, select the Hyperlink option and then the action you want to perform - Edit Hyperlink or Remove Hyperlink.